We’re pretty proud of the fact that we’ve been able to help support local community groups, sporting clubs, schools, festivals and events. We did it! $2,300 raised for Defib in a Day! Footscray West PS can now purchase a defibrillator thanks to support from the local community. 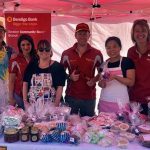 Inner West Community Enterprises offers grant funding and sponsorships for community groups and clubs. Seddon Community Bank® Branch makes community funding possible and has everything you’d expect from a big bank. Find Melbourne’s inner west community calendar here; learn about and get involved in a range of local events near you. Available for community groups, clubs, small businesses and SME’s who need office facilities in the inner west. This is what community partnership in Melbourne's West is really about. Inner West Community Enterprises supports the community through a range of initiatives. From providing community banking, to helping local groups and clubs access much needed funding, to desk and meeting space and even helping promote them. It’s the bank that backs the community by sharing its profits to support local groups and clubs. From space to place, it’s vibrant, modern day coworking that brings like-minded organisations together. Wide-reaching local newspaper covering Melbourne’s west featuring the latest news, events and more. This annual event invites community groups and clubs to pitch for funding made possible thanks to local partnerships.